Extra thick. Super absorbent. Flexible. Perfect for mopping up and wiping down. Made from biodegradable sponge. 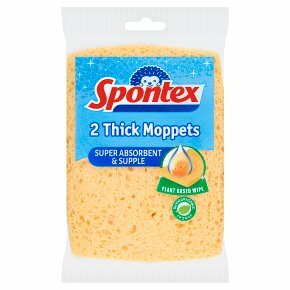 Spontex Thick Moppets are extra thick and super absorbent. These thick and flexible sponge wipes are perfect for mopping up spills and wiping down surfaces. Sponge size: 16 x 12cm. Composition: biodegradable sponge. Assorted colours, mixed pack. Pack will be selected at random. Wet before every use. Machine washable up to 40°C. Rinse thoroughly before and after each use. Use only with diluted bleach (dilute bleach as follows: 180ml of bleach for 5L of water).